A Bounceable Time Event Party Rentals delivers great party rental equipment to a large area of northern South Carolina and southern North Carolina centered on York SC and surrounding communities and Charlotte NC and it's surrounding communities. 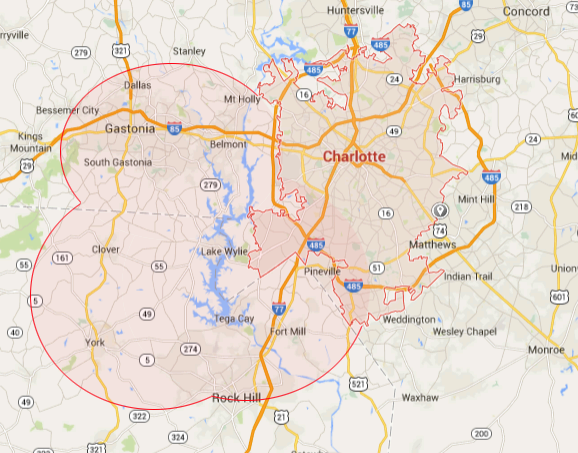 Communities like York SC, Clover SC, Lake Wylie SC, as well as Charlotte NC and Gastonia NC are all in our delivery zone. And that's just a few! The information below is a general outline of our party rental service area, so if you don't see your specific location indicated here, please call us at (803) 684-9594 and we will be happy to assist you with complete party rental delivery information for your location.